I was lucky enough to work with the BGS for the research component of my MSc in Mining Geology at the Camborne School of Mines. After a whirlwind fortnight of fieldwork in north-east Romania (see my previous blog) I started looking at the rocks we collected in much greater detail than the naked eye allows. 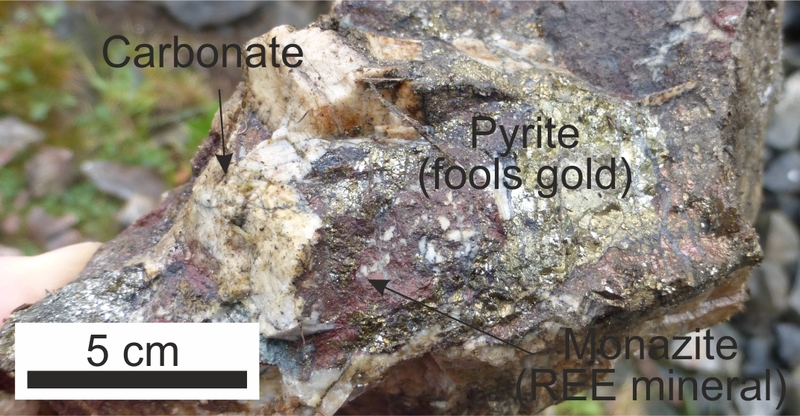 Through a combination of microscopy and geochemistry, my project aimed to provide an overview of rare earth element (REE) mineralisation from both a magmatic and hydrothermal perspective. Rare earth elements are vital to many of today’s technologies, from electronics to green technologies; markets such as wind turbines, light technologies, hybrid and electric cars are all forecasting rapid growth in the coming years and so REE demand will rise. Ironically, REEs are not rare, their abundances in the crust are comparable to elements such as copper and bismuth. The name merely surmises the difficulties chemists first had in separating the elements from each other, and this still presents challenges for the minerals extractive industry today. REE production and supply is dominated by China. In 2017 they supplied 95% of the world's REE. There is a global drive to reduce reliance on China for REE and the EU is providing encouragement for a domestic REE industry. One such, lesser known, European rare earth element deposit is where my project was focused: the igneous Ditrău Complex in Romania. It is an intrusion of magma within the earth’s crust (ca. 19 km diameter), which solidified over 200 million years ago. What makes it interesting to economic geologists is a series of carbonate veins, 1-2 m wide, enriched in REE. There are also occurrences of niobium and molybdenum within the intrusion. Since finishing my MSc I’ve started my PhD, so writing everything up into a paper had to take a bit of backseat, but finally… our paper on the Ditrău Complex has been published! Below is a little summary of our main findings from the open access (!) paper, so if you're interested, you can read the paper in full here. From fieldwork observations we began to see that the intrusion had been emplaced in a broadly horizontal magma chamber, which had subsequently been tilted towards the east during a large-scale mountain building event (the Variscan orogeny). The tilting meant that on fieldwork, we had a fantastic transect across the range of crystallised rocks: from the most mafic (low SiO2 contents) in the north-west to the most evolved (high SiO2) in the east. The south east of the area was really interesting: the rocks were highly altered and through a combination of field observations and geochemistry, we identified this as the roof zone of the solidified magma chamber. petrological ‘fingerprint’ of alteration. These fluids leached a range of economically interesting elements from the rocks they passed through. Ultimately, the buoyant fluids reached the top of the intrusion (the roof zone) and were deposited along fractures in the rock, plausibly due to pressure decreases. These fractures are rich in minerals such as zircon and pyrochlore. 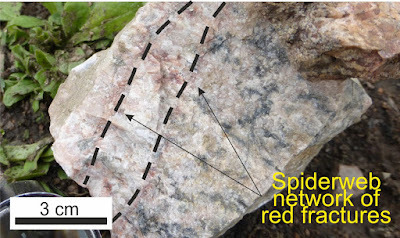 In this area of the Ditrău Complex, the most common rock we picked up on fieldwork was dusty white with a spider web of criss-crossing red fractures. The major REE mineralisation is hosted in carbonate-rich veins that crosscut the Ditrău Complex. We wanted to establish if these veins were crystallised from the same fluid that altered the roof zone of the complex. To do this we looked at the chemistry of a particular mineral: apatite. This is a great mineral, apart from being what your teeth are made out of, it is distributed throughout the Ditrău Complex so we could use the apatite crystals to establish if they crystallised from liquids of different compositions. Crucially, these REE-rich carbonate veins are compositionally distinct from the other rocks, including the altered roof zone. So the complex had a late-stage REE- and carbonate-rich fluid that cut through the crystal mush. The source could be a later carbonatite emplaced below the complex, but this hypothesis needs to be further explored. If you’re curious about what carbonatite looks like, Ol Doinyo Lengai, "Mountain of God" in the Maasai language, is the only place on earth erupting a carbonate magma today. This work was funded by the EURARE project, which aimed to set the basis for a European REE industry. Work on the samples collected from the Ditrău Complex is continuing, and part of this work hopes to characterise the different ages of areas of economic interest.